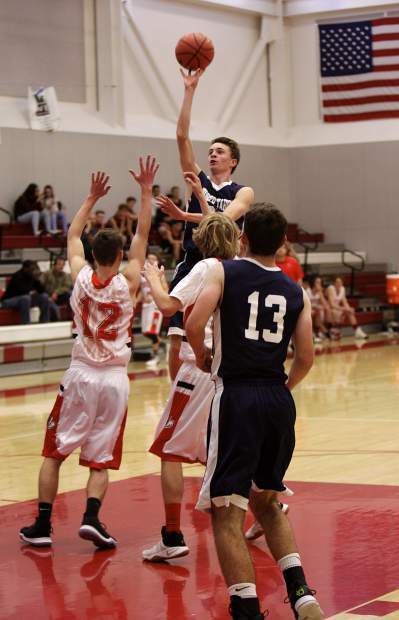 Senior Ted Gibeaut glides in for a basket against Truckee on Thursday, Nov. 30. The North Tahoe basketball team kicked off the 2017-18 season on the road against Quincy on Nov. 28, and while the result was a tough 68-61 overtime loss, a new coach has already started changing the culture at the school with a set of raised expectations for a program that hasn’t finished with a winning season in more than a decade. Ginty joins North Tahoe after coaching as an assistant at Oakdale High School and Turlock High School. He was also and assistant basketball coach at Point Loma Nazarene University. He will lead a junior-heavy squad into the 2017-18 season with a lineup boasting just two senior players in Nolan Spencer and Ted Gibeaut. Gibeaut opened the year with a massive game, dropping 33 points on 12 of 24 shooting against Quincy. After Quincy, the Class 2A Lakers traveled to Truckee to take part in the Truckee Classic. North Tahoe opened the tournament with a 72-36 loss to the Class 3A Wolverines, but Ginty liked what he saw from his team against Truckee’s 2-3 zone. Junior Murphy Scott stood out on the night with three, 3-pointers. North Tahoe would lose the following day, 67-55, to Class 2A Silver Stage. With several games before their Dec. 15 Class 2A Northern League opener against Battle Mountain, the Lakers are using the preseason to build on a foundation, which was already set over the summer by the program’s youth camps, for what Ginty hopes becomes a solid Lakers program. “We’re really trying to emphasize the fundamentals and the fundamental development,” Ginty said. “That really starts with our youth development. This year’s team doesn’t have a lot of size up front, but does have good length at the guard and forward positions, which should play well into Ginty’s man-to-man pressure style of defense. “We’re definitely going to try to use our length and our quickness to our advantage. There’s some kids that are very athletic, and so we’re finding ways to use their athleticism whether they have a ton of basketball experience or not,” he said. The Lakers will continue with tournament and road games during the preseason, and won’t make their home debut until a Dec. 12 nonleague matchup against Portola. The North Tahoe girls will be looking to rebound from a 1-19 campaign last season, as the program searches for its first winning season since 2008-09. The Lady Lakers suffered a 59-34 loss on the road against Quincy to open the year, but had a solid performance from senior Sarah Prye, who led the team with 10 points. Sophomore Anaka Hudson was next for North Tahoe with seven points, followed by senior Merrill Green with six points and a team-high five rebounds. Freshman Alisha Lee led the Lakers with four assists and two steals. The girls will next travel to play in the Whittell Tournament on Thursday, Dec. 7, and will open tournament play against Owyhee. White Pine and Pershing County were the top teams out of the Northern League last season and again should be in the mix to contend for a league championship. North Tahoe will open league play on Dec. 15 against Battle Mountain. The Lakers will play their home opener on Dec. 19 in a nonleague contest against Coral Academy of Science — Reno.